The Custom Filled Wedding Hourglass includes a hand polished 9" high Basic Wedding Hourglass laser engraved on the end-caps with the messages of your choice. The sand can be from the beach where your wedding ceremony took place, your honeymoon or another special place. Note: When an hourglass case is made of two different hardwoods the main or dominant color is shown in the swatch. The secondary color is that of the spindles and is shown in the bottom right hand corner of the swatch. Instructions for sending your sand will be provided. The running time cannot be guaranteed and will be random when using sand that your provide. After sieving your sand and putting it into the glass I will seal the glass and mount it in the hardwood case that you have chosen. 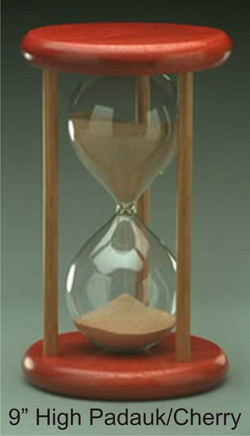 Please allow a minimum of 30 days for production time from the time that I receive the sand until I will be able to complete and ship your Custom Filled Wedding Hourglass back to you.